In the chaotic last days of the war, a small troop of battle-weary American soldiers captures a German spy and makes an astonishing find--his briefcase is empty but for photos of beautiful white horses that have been stolen and kept on a secret farm behind enemy lines. Hitler has stockpiled the world's finest purebreds in order to breed the perfect military machine--an equine master race. But with the starving Russian army closing in, the animals are in imminent danger of being slaughtered for food. With only hours to spare, one of the U.S. Army's last great cavalrymen, Colonel Hank Reed, makes a bold decision--with General George Patton's blessing--to mount a covert rescue operation. Racing against time, Reed's small but determined force of soldiers, aided by several turncoat Germans, steals across enemy lines in a last-ditch effort to save the horses. Pulling together this multistranded story, Elizabeth Letts introduces us to an unforgettable cast of characters: Alois Podhajsky, director of the famed Spanish Riding School of Vienna, a former Olympic medalist who is forced to flee the bomb-ravaged Austrian capital with his entire stable in tow; Gustav Rau, Hitler's imperious chief of horse breeding, a proponent of eugenics who dreams of genetically engineering the perfect warhorse for Germany; and Tom Stewart, a senator's son who makes a daring moonlight ride on a white stallion to secure the farm's surrender. 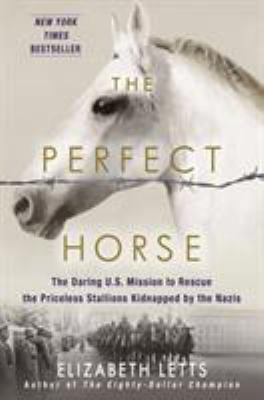 A compelling account for animal lovers and World War II buffs alike, The Perfect Horse tells for the first time the full story of these events. Elizabeth Letts's exhilarating tale of behind-enemy-lines adventure, courage, and sacrifice brings to life one of the most inspiring chapters in the annals of human valor.